At RP Race we push boundary of design, fabrication and performance to help you push your limit. We are in business to deliver part that the diehard enthusiasts need - not cookie cutter stock upgrade parts. It takes hard work to meet our standards. From the drawing board to the manufacturing process, every RP Race product is made with innovation in mind. With our 3D CAD design process, RP Race products are custom build for performance. We build and test again and again. We are crazy like you! Everything we do, come from a true desire to make a difference. Our dynamic team enjoys making products for you. At the end of the day those values REWARD us with: satisfied customer, satisfaction at work, race win, more horsepower, faster lap time and enjoying life at full speed! I have created RP Race because I cannot resist tinkering on parts, I just love to push thing a bit farther than most but also I just enjoy winning as much as I hate losing! I am a racer, I need the adrenaline rush. Racing get my blood flowing. 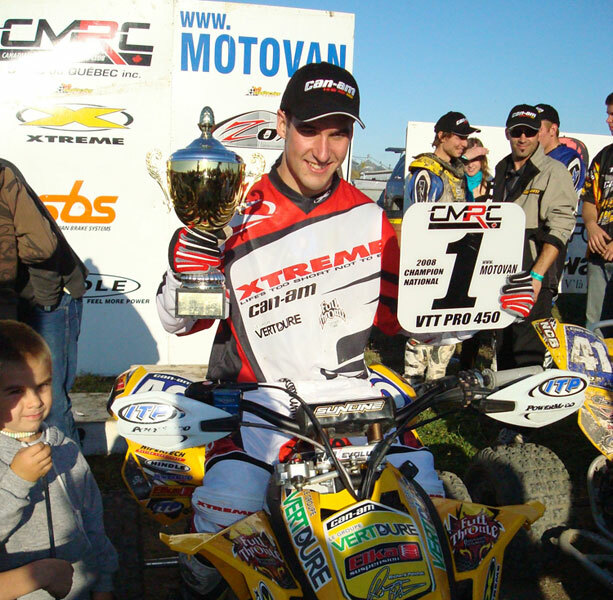 I have won 7 Canadian national ATV championships and that was not enough for me. I went to the USA to do the AMA Pro ATV championship because I wanted to compete with the very best. I would drive 30 hours back from a race just thinking how to make thing better… test a new chassis setup, built a new head pipe for more top end… Limits are not part of my way of life, I am fueled by passion. I have won hundreds of races in my career but the one I didn’t won always made me stronger. Now I want you to enjoy the addiction to WIN and my product are designed and build for that! Find a race! We will make sure you are faster! Enjoy my products and share the passion we have!